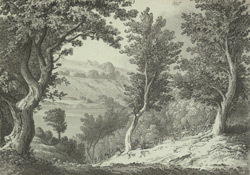 A view in ink of the way to the gill or ravine containing the wells at Butterby Springs, near Durham. These famous mineral springs were first recorded in 1607. Reddish salty water bubbled to the surface on the banks of the River Wear and locals evaporated the water to produce salt. Opposite the salt spring was a sulphur spring, The sulphur water was analysed in 1807 by local chemist WR Clanny, who claimed it to be of great virtue. Thereafter it was used as a remedy for diseases caused by the fumes produced in smelting and refining in the nearby leadworks. Mining towards the end of the 19th century is supposed to have disturbed the flow of water from these springs. Today there are no obvious signs of any of the springs and it is difficult to imagine the "great numbers of persons [who] frequent these wells in order to drink the water", as recorded in 1824 by George Allen.